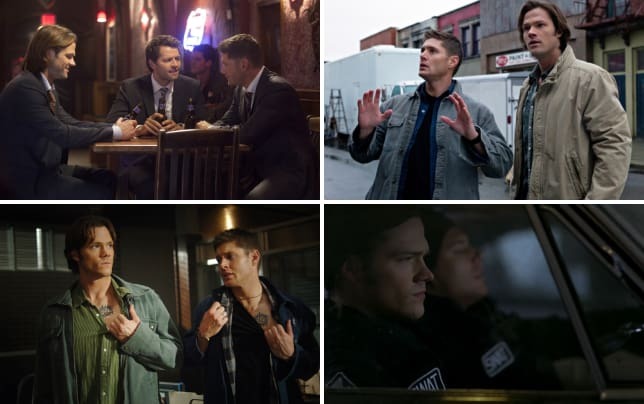 Supernatural Season 11 Episode 22 prepped for the big showdown between the ultimate beings, including a therapy session with Lucifer and recruiting witches, angels and demons. But was the end result any good? And how did the Darkness manage to gain the upper hand? TV Fanatic staff writers Sean McKenna and Christine Laskodi and The Winchester Family Business’ Alice and Nightsky are here to discuss “We Happy Few”… and a few of them were not happy. 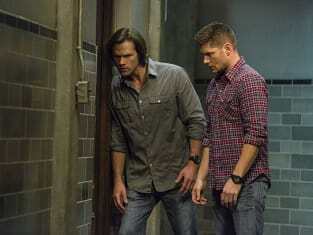 Join them in the latest Supernatural Round Table! Christine: I really liked that Sam was ready and willing to take the Mark, but I'm also really glad that he didn’t actually have to do it, because I'm so over the Mark storyline. But Sam's courage, even knowing what it means to carry the Mark, shows how much he's grown this season as a character. I also got a chuckle out of Dean's "Worst episode of Full House ever" quote because I was thinking along similar lines. Nightsky: I have to agree with Christine that seeing the Mark branding itself onto Sam's arm was really dramatic. Unlike her, though, I would have enjoyed that storyline. Sam front and center, slowing turning evil, would have been an interesting character study. Alice: I’m just going to pass on this one. This episode was as painful all the way around as a root canal. Even the end was really tough to watch. This is supposed to get me all excited about the finale next week? Epic fail. Sean: Favorite scene? I had a lot of least favorite scenes to choose from in this episode. I guess I’ll pick Crowley getting to give that big smackdown to Amara, but really, I was just disappointed in this episode. What did you think of Lucifer and God’s therapy session? Christine: In my opinion, their entire conversation would have had more impact if it had been Mark Pellegrino's Lucifer. For some reason, Chuck having that conversation with Castiel, essentially, just felt wrong to me. I think because I know and love Pellegrino's Lucifer so much, I couldn't fully enjoy that moment between God and the Devil. Nightsky: I thought it was ludicrous. I was embarrassed for the show (and for myself!) watching it. Several fans have theorized that the whole episode was God's projection of the future specifically because that scene was so much like a daytime soap opera parody. I did like the brothers getting bounced into the peanut gallery, though! Alice: Initially I thought it was mildly funny, but then I had to think about it and analyze what happened. It was pretty damned ludicrous. How can all those years of pain and abandonment lead to this awkward moment of hashing it out in one scene? Lucifer has every right to join Amara since they were wronged in the same way by God. But Lucifer gets to act like an insolent teenage brat instead? That’s… oh that’s just not right. Sean: Maybe if it was two different characters, I might have enjoyed it. With God and Lucifer it was just silly and off-putting. Christine: I hope not... I hope he was just banished somewhere. Because for Lucifer to go that suddenly, after what, seven or eight years of him fighting against the Winchesters? That seems like a disservice to the character. He may have been a bad guy, but he was a notable bad guy. Nightsky: I believe he was. Amara said, "Goodbye, Nephew,” and his angel grace seemed to evaporate, so it certainly looked like he was killed. I find it hard to accept that Amara would have cared enough to spare Castiel, even for Dean, so that part seems odd. Alice: I have no idea, but at this point, any further moments with him will just continue to assassinate his character and invalidate Sam’s Supernatural Season 5 sacrifice. I’m so ready to forget Lucifer ever existed and move on. If this means he’s dead, so be it. He can join his other useless archangel brothers. Sean: I would think so, but how did Castiel survive? It just seemed like he was dead, but I wouldn’t be surprised if Supernatural brought him back or something. Were you surprised the Darkness was able to overpower God? Christine: No, because I have a feeling it was all part of the "plan." Chuck never said the plan. Everyone just said it was crazy. Nightsky: Yes. If God needed four archangels to defeat her when he was at full power, how could she defeat him when she had just moments before offered her surrender because of the severity of her injuries? It doesn't track at all. Was it all a massive "sting" operation? I think that's a distinct possibility — and I don't think Dean was in on it because of his vulnerability to Amara. Alice: Surprised isn’t exactly the word. Perplexed is more like it. They’re equals. How and why was that allowed to happen? I’ve heard theories that Chuck allowed her to do that, but I don’t buy it. I think her being more powerful was just a ploy to convince us we needed archangels and bring Lucifer back because these writers have no idea what to do with Misha Collins. Sean: I was surprised. It just seemed improbable considering that Amara had been damaged before even getting to face God. But was it all just a ruse? Hmmm. Either way, it still doesn’t sit right with me. Will God, the Darkness or both be killed in the finale? Christine: I really don't know! I'm predicting Supernatural Season 11 and Supernatural Season 12 will go together the way that Supernatural Season 4 and Supernatural 5 did. I just don't think they could kill God or the Darkness and then move on to anything bigger. It's God and his sister. That's your "go big, go home," move. I think whatever the outcome, this story will spill into next season. Nightsky: Because of God's yin/yang speech, Amara cannot die without God also dying. I really, really don't want the show to kill God, so I'm expecting Amara to end up in the Empty (or her cage, if they are not the same). I don't expect her to be alone, though. God will leave again, but I don't know if it will be voluntarily or whether he will join his sister in the Empty. I will be happy with the former; extremely unhappy with the latter. What will be the hook for Supernatural Season 12 then? Alice: Isn’t killing God pretty much the end game? I really, really hate the way this show has humanized God and put him in the same sort of predicament that humans like Sam and Dean would face. Oh no, God isn’t invincible, maybe he’ll die! Give me a break. I don’t want to see a diminished God. I think the writers have bitten off more they can chew in terms of this story arc. To answer the question, I have no idea where they are going with this but if they have the balls to kill God and his sister, the ultimate creators, in exchange for a cheap plot, I’m picking my ball and going home. Nothing more to see here folks. Sean: I hope God is not killed off. That would just be ridiculous. Really, it makes me think about Supernatural’s actual end game, like series end. With the God and the Darkness, these are the two power players, so it would make sense if Supernatural Season 12 is the final one. The Darkness should be defeated, but I’m wondering if the writers are even sure where they should go with this one. I’m just hoping the finale gives me some turn around and gets me excited again.